The DP63700 series has been discontinued. Please see the DP25-VERMS as a possible alternative or contact our sales department. The DP63700 Series panel meters offer many features and performance capabilities to suit a wide range of industrial applications. Models include AC true RMS voltage/current inputs. The optional plug-in output cards allow the opportunity to configure the meter for present applications while providing easy upgrades for future needs. The meters have a bright 14 mm (0.56") LED display. 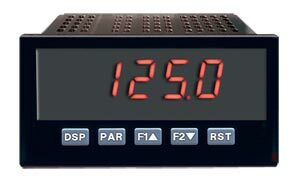 The unit is available with a red, sunlightreadable or a standard green LED. The intensity of display can be adjusted from dark-room- to sunlight-readable, making it ideal for viewing in bright light applications. The meters have up to 4 setpoint outputs, implemented on plug-in option cards. The plug-in cards provide dual form “C” relays (5A), quad form “A” (3A), or either quadsinking or quad-sourcing open collector logic outputs. The setpoint alarms can be configured to suit a variety of control and alarm requirements. Communication and bus capabilities are also available as option cards. These include RS232, RS485, and MODBUS.